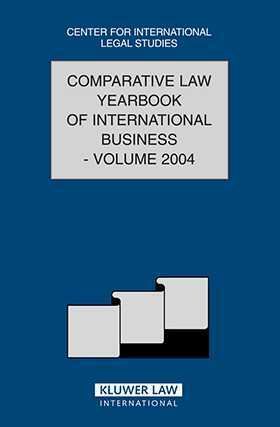 The 2004 volume of the Comparative Law Yearbook of International Business contains a wide variety of topics of interest to international commercial lawyers and their clients. Various areas of company law are discussed, including mergers and acquisitions, piercing the corporate veil and the financing of share acquisitions. The Yearbook also contains several chapters on investments and securities, including the need for corporate governance in this area and the role of collective investment schemes in Bermuda. Some chapters deal with the introduction of now technology into the competition law issues encountered by the telecommunications industry. The introduction and effects of new legislation generally are also addressed, including the new Ukrainian Commercial Code and Brazilian Civil Code. In addition to discussions on intellectual property, arbitration and asset protection, the Yearbook contains a section on real property rights, including a very interesting comparison between the way in which China and Indonesia view property rights and the treatment received by such rights in Western society. Various areas of law also are looked at from a European point of view, such as the increase in American-style asbestos litigation in Europe, the hiring out of workers within Europe and the effect of the European Convention on Human Rights upon business. With the ever-increasing introduction of new technology, the expansion of global communications, new attitudes towards business and commerce and increased awareness of personal and property rights, there is a constant need for the law to develop in order to adequately deal with these issues. The yearbook branches out into some of the innovative and topical areas of contemporary law, and should be of great interest to anyone involved in modern-day business.